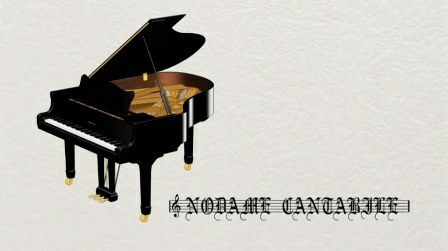 Of all of the anime shows that I watch, Nodame Cantabile is one of two shows that I’d be most likely to suggest to people who don’t watch anime. Why? Because fun, light-hearted, humorous, and it doesn’t distract people. A new-to-anime-viewer doesn’t have to watch and wonder why an alien wearing a Lulu skin suit is trying to take over the world, or a battle princess and an 8ft tall scarred guy with a blue flashlight are destroying things (And I’m glad I started watching Pumpkin Scissors again, its gotten interesting), or a guy who hangs around with foxes, demon-slayers, and sick girls (God, I love Kanon). The first episode introduced Chiaki and Nodame. I’ve watched the live-action version without understanding it, but I’ve developed a biased because of that. Now that the live action version has stopped airing on the local station, I’m sure that I’ll become accustomed to the anime actors. That’s not entirely true, I’ve come to totally like Ayako Kawasumi as Saber Sara Werec Nodame over Juri Ueno from the live action version. Not that Juri Ueno was bad, its just a preference. I still prefer Hiroshi Tamaki as Chiaki because he has the right harshness in his voice for the role of the perfectionist Chiaki. And I prefer the look and voice of Eita as Ryutaro Mine.